After 10 seasons as the Bobcats, the Charlotte franchise is returning to the city's roots, renaming and rebranding as the second coming of the Hornets. Today they revealed, from left to right, their home, road, and alternate jerseys. In this light at least, the teal appears to be a brighter shade than what the Hornets used to use. It looks really sharp as piping on the home whites, less so as the primary color on the eyesore of a third jersey. 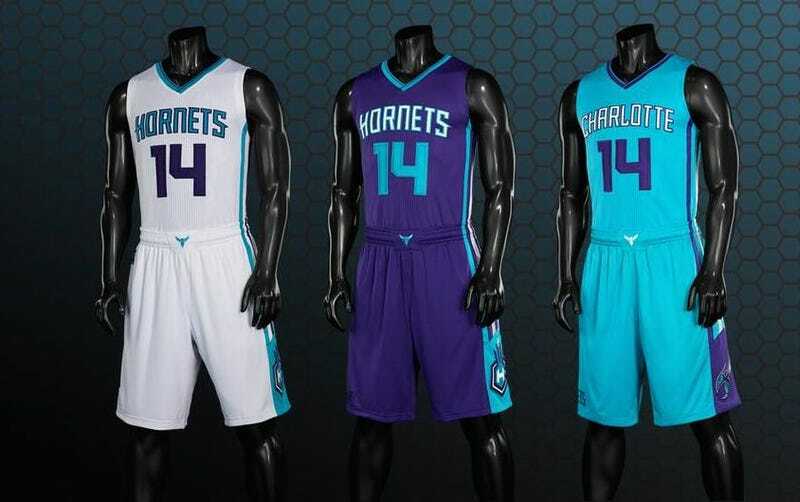 Noticeably missing are the pinstripes that defined those old Hornets uniforms. As much as I like these (and I do like them), and as much as the old jerseys screamed 1990s, this feels like a big loss. Your thoughts on the new uniforms?